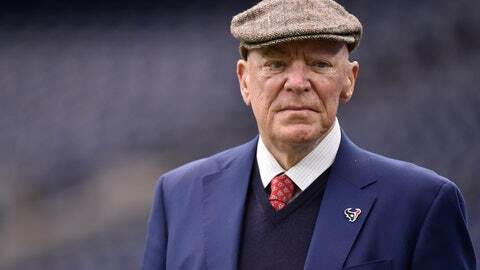 HOUSTON (AP) — Robert “Bob” McNair, the man who brought football back to Houston after the Oilers left for Tennessee by founding the Texans, has died. He was 81. One of the NFL’s most influential owners, McNair had battled both leukemia and squamous cell carcinoma in recent years before dying in Houston on Friday. The team did not immediately release a cause of death, but said he died peacefully with wife Janice and his family by his side. When Houston lost the Oilers to Tennessee after the 1996 season, McNair made it his mission to return the NFL to the city. He formed Houston NFL Holdings in 1998, and on Oct. 6, 1999, he was awarded the 32nd NFL franchise. The Texans began play in 2002. His son, Cal McNair, who has been serving as the team’s chairman and chief operating officer, will lead the team in the wake of his father’s death. President George H.W. Bush, McNair’s longtime friend, issued a statement on his passing. Dallas Cowboys owner Jerry Jones raved about McNair and his contributions to the NFL. .
“He was not only a strong personal and professional influence on me, but his presence in the NFL helped grow and develop our league on so many levels,” Jones continued. Many current and former Texans took to social media to share thoughts about McNair and send condolences to his family. A powerful force in the NFL, McNair served as chairman of the league’s finance committee and as a member of the audit committee. It was then he revealed he’d dealt with skin cancer for about 20 years. He also noted then that he’d remain in charge of the team, but would work on delegating responsibilities to other members of his staff. “We’re in terrific shape,” McNair said. “I’ll continue being the CEO and continue doing everything I can to put together a winning football team; that’s what we’re all about. We’ve won this other battle, and now we’ve got to win the battle of football. “During his nearly two decades as an NFL owner, Bob McNair left a lasting mark on his city and our league,” NFL Commissioner Roger Goodell said in a statement. “His leadership and determination brought the NFL back to Houston, built a magnificent stadium that hosted two Super Bowls, and his beloved Texans are in the midst of another successful season and are again contending for a place in the postseason. McNair made the agonizing decision to fire longtime friend and coach Gary Kubiak late in the following season as the Texans limped to 2-14, tying a franchise record for losses. He hired O’Brien in 2014 and the team improved to 9-7 in his first year, but missed the postseason. Houston put up an identical record in 2015, but this time in a weak AFC South it was enough to reach the postseason for the third time. That season ended with an embarrassing 30-0 wild-card loss to Kansas City. Not exactly. Osweiler struggled and his name was added to a long list of quarterbacks who couldn’t help the owner get the title he so longed for. Osweiler was benched late in the 2016 season before getting his job back (through injury to his replacement) in time for the playoffs. But he threw three interceptions in a loss to New England in the divisional round, and Houston had seen enough and shipped him to Cleveland a few months later. He also founded the AdvoCare Texas Bowl, which has provided more than $700,000 in funds to the DePelchin Children’s Center in Houston.